Florida Teacher Requires Transgender "Respect" from children! | Public Advocate of the U.S.
Florida Teacher Requires Transgender "Respect" from children! A Florida teacher's request for students to use gender-neutral pronouns has left parents divided in opinion. 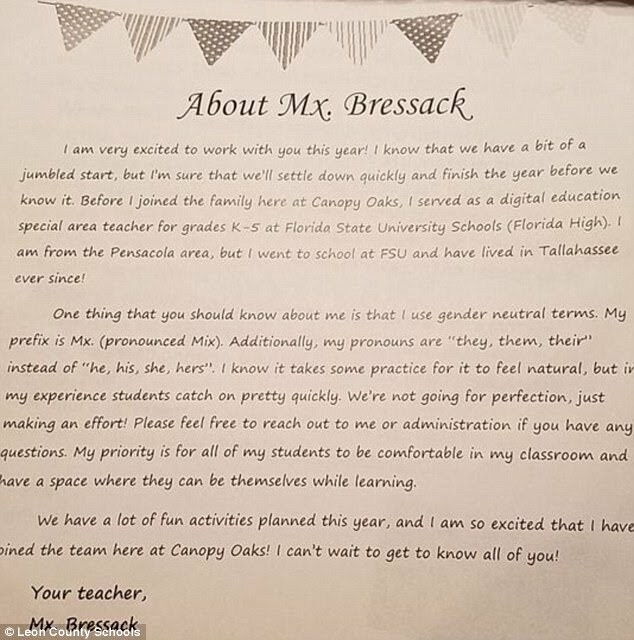 Math and science teacher Chloe Bressack, who teaches at Canopy Oaks Elementary in Tallahassee, Florida, sent the letter home to the 5th grade class at the beginning of the year. The letter says: 'One thing you should know about me is that I use gender neutral terms.